بهمنی, مهدی, اسدی, ناصر. (1397). دایاسپوراها بازیگران با نفوذ عصر جهانی شدن: تبیینی نظری و تحلیلی موردی. مطالعات راهبردی سیاستگذاری عمومی, 8(29), 93-114. مهدی بهمنی; ناصر اسدی. "دایاسپوراها بازیگران با نفوذ عصر جهانی شدن: تبیینی نظری و تحلیلی موردی". مطالعات راهبردی سیاستگذاری عمومی, 8, 29, 1397, 93-114. بهمنی, مهدی, اسدی, ناصر. (1397). 'دایاسپوراها بازیگران با نفوذ عصر جهانی شدن: تبیینی نظری و تحلیلی موردی', مطالعات راهبردی سیاستگذاری عمومی, 8(29), pp. 93-114. بهمنی, مهدی, اسدی, ناصر. دایاسپوراها بازیگران با نفوذ عصر جهانی شدن: تبیینی نظری و تحلیلی موردی. مطالعات راهبردی سیاستگذاری عمومی, 1397; 8(29): 93-114. «دایاسپورا» یک مفهوم مهم در علوم اجتماعی معاصر است. این مفهوم در دو دهۀ اخیر مورد توجه فزایندۀ اندیشمندان رشته­هایی چون جامعه‌شناسی، مردم‌شناسی، علوم سیاسی و مطالعات فرهنگی واقع شده که نتیجۀ آن را می­توان سامان یافتن مطالعات دایاسپورا به عنوان یک حوزۀ­ نوظهور تحقیقاتی بین‌رشته­ای دانست. دایاسپوراها امروزه در شمار تأثیرگذارترین بازیگران غیردولتی هستند که هم بر سیاست داخلی کشورها تأثیرگذارند و هم نقش­های مهمی در حوزه­های مختلف بین‌الملل ایفا می­کنند. در منابع فارسی توجه بسیار کمی به این مفهوم و مصادیق آن و تأثیراتی که دارند صورت گرفته، درحالی‌که در منابع و مراکز علمی غربی مورد توجه روزافزون بوده است. این مقاله از زاویۀ نگاه محقق ایرانی در پی پاسخ به این سؤال اصلی است که دایاسپورا دقیقاً چیست و چه تأثیراتی بر محیط پیرامون خود دارد؟ مراجعه به منابع دسته اول برای تجزیه و تحلیل نظری این پدیده در کنار گونه‌شناسی مصادیق مختلف آن با اتکا به روش مطالعۀ موردی، رویکرد اصلی این مقاله است که می­توان با استفاده از آن به سؤال­های اصلی و فرعی این مقاله پاسخ داد. بهمنی، مهدی. 1395. «دایاسپوراها و منافع ملی جمهوری اسلامی در عصر جهانی شدن»، دوﻓﺼﻠﻨﺎمۀ ﻋﻠﻤﯽ-ﭘﮋوﻫﺸﯽ داﻧﺶ ﺳﯿﺎﺳﯽ، ﺳﺎل12. ﺷﻤﺎرة 2 (ﭘﺎﯾﯿﺰ و زﻣﺴﺘﺎن). ﭘﯿﺎﭘﯽ 42. ﺻﺺ19-611. http://farsi.alarabiya.net/fa/iran/2016/12/25 (آخرین دسترسی: 8 آبان 1396). Abdile. Mahdi and Päivi Pirkkalainen. 2011. “Homeland Perception and Recognition of the Diaspora Engagement: The Case of the Somali Diaspora”, Nordic Journal of African Studies V 20, N 1. pp. 48–70. Aikins. Kingsleyand Nicola White. 2011. Global Diaspora Strategies Toolkit, (Dublin: Diaspora Matters). Al-Ali. Najde S. 2007. “Iraqi Women in Diasporic Spaces: Political Mobilization, Gender and Citizenship”, Revue Des Mondes Musulmans et de la Méditerranée : 3. See online: http://remmm.revues.org/3371 (آخرین دسترسی: 27 دی 1397). Anderson. Fiona B. March 2008. “Constructing the Diaspora: Diaspora Identity Politics and Transnational Social Movements”, Paper prepared for presentation at the 49th Annual Meeting of the International Studies Association, (San Francisco. CA). p. 2. Appadurai. Arjun.1990. “Disjuncture and Difference in the Global Cultural Economy”, Theory Culture Society, V 7. pp. 295-310. Baser.Bahar, and Ashok Swain.Sep 2008. “Diasporas as Peacemakers: Third Party Mediation in Homeland Conflicts”. 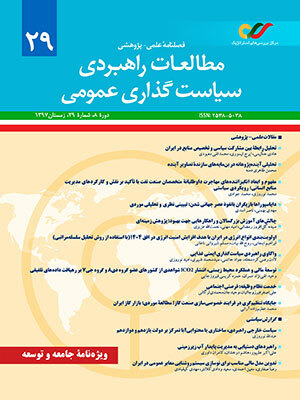 International Journal on World Peace V 25, N 3.pp. 7-28. Blayney. Caroline. 2011. “Iraqi American Diasporic Philanthropic Remittances to Iraqi Refugess in Jordan: Past Projects and Potential for Future Partnerships”, in Takaful 2011: The First Annual Conference on Arab Philanthropy and Civic Engagement, (Cairo: The American University). Blendstrup. Angelika. 2007. They Made It: How Chinese, French, German, Indian, Iranian, Israeli and Other Foreign-Born Entrepreneurs Contributed to High-Tech Innovation in Silicon Valley, the US and Overseas, (Silicon Valley, CA: Happy About). Butler. Kim D. (Fall 2001). “Defining Diaspora, Refining a Discourse”, Diaspora: A Journal of Transnational Studies, V 10, N 2.pp. 189-219. Cakmak. Cenap.2007. “Civil Society Actors in International Law and World Politics, Definition, Conceptual Framework, problems”, International Journal Of Civil Society Law, V1, N1.pp. I7-35. Cesari. Jocelyne. 2013. "Religion and Diasporas: Challenges of the Emigration Countries", INTERACT Research Report 2013, at:http://interact-project.eu/docs/publications/Research%20Report/INTERACT-RR-2013-01.pdf (19 آبان 1397). Clifford. James. 1994. “Diaspora”, Cultural Anthropology, V 9, N 3. pp. 302-338. Cohen. Robin. 2008. Global Diasporas: An Introduction, (New York: Routledge). Cochrane. Feargal et al. August 2009.“Home Thoughts from Abroad: Diasporas and Peace-Building in Northern Ireland and Sri Lanka”, Studies in Conflict and Terrorism, V 32, Issue 8. pp. 681-704. Haynie. Devon. 17 Mar 2016. “10 Countries With the Most Irish Emigrants”, usnews, at:https://www.usnews.com/news/best-countries/articles/2016-03-17/10-countries-with-the-most-irish-emigrants (19 آبان 1397). Ionescu. Dina. 2006. Engaging Diasporas as Development Partners for Home and Destination Countries: Challenges for Policymakers; (Geneva: IOM Press). Kaldor. Mary. 2001. New and Old Wars: Organized Violence in a Global Era, (Massachusetts: Polity Press). Kuznetsov, Yevgeny and Charles Sabel. 2006. “International Migration of Talents, Diaspora Networks and Development: Overview of Main Issues”, in Diaspora Networks and the International Migration of Skills, ed. by Yevgeny Kuznetsov, (Washington, DC: The World Bank Press). Liddell. Henry G, and Robert Scott. 1996. A Greek-English Lexicon. (Oxford: Clarendon Press). Lyons. Terrence. 2007. “Conflict-Generated Diasporas and Transnational Politics in Ethiopia”, Conflict, Security and Development, V 7: N 4. pp. 529-549. Lyons. Terrence and Peter Mandaville. 2010. “Diasporas in Global Politics”. Published by the Centre for Global Studies in Gorge Mason University. Oxford English Dictionary Online (2013): http://www.oxforddictionaries.com/definition/learner/diaspora (19 آبان 1395). Rosenau. James N. 2006. The Study of World Politics: Globilization and Governance (Volume 2), New York: Routledge. Shain, Yossi. 1994. “Marketing the Democratic Creed Abroad: US Diasporic Politics in the Era of Multiculturalsim”, Diaspora: A Journal of Transnational Studies, V 3, N1. pp. 90-91. Shain, Yossi. Summer-Fall 2002. “The Role of Diasporas in Conflict Perpetuation or Resolution”, SAIS Review, V 22, N 2. Sheffer. Gabriel. 2003. Diaspora Politics At Home Abroad, (New York: Cambridge University Press). Tölölyan. Khachig. Spring 1996. "Rethinking Diaspora(s): Stateless Power in the Transnational Moment". Diaspora: A Journal of Transnational Studies, V 5, N 1. pp. 3-36. White House (The), US National Security Strategy, Feb 2015, at:https://www.whitehouse.gov/sites/default/files/docs/2015_national_security_strategy.pdf (19 آبان 1397).